254-753-4900 Race ONE welcomes Wacoans and visitors to North Waco for this annual neighborhood event! Affordable chip-timed 5K! Perfect timing to loosen up your muscles for the marathon race events being held in our city the following day! All proceeds benefit programs of Mission Waco Mission World (501c3 non-profit). Fun prizes for Overall Male/Female and 1st place in age groups! Medals for 1st, 2nd, 3rd in age groups. Additional Date Info: 5K at 8am. Fun Run at 9am. 5K awards at 9:30am. 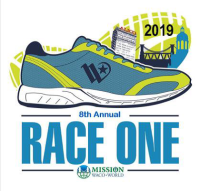 $15 pre-register for 5K ($20 race day). $10 pre-register for Fun Run ($15 race day). Free for spectators.